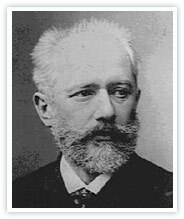 Peter Ilyich Tchaikovsky was born on 7th May 1840 in Votkinsk, in the western Ural area of Russia as the son of a mining engineer who worked for the state. The hypersensitive young man studied law at the St Petersburg Law School and, at 19 years of age, began a career as a civil servant at the Ministry of Finance. He devoted his spare time to music, and to the dismay of his parents, left the civil service in 1862 to become a student at the St Petersburg Conservatory. After the examination in 1865, he obtained a position teaching at the Moscow Conservatory, where he taught theory and made a name for himself as a composer. On the advice of his father and with the hopes of stilling the conflicts he felt about his homosexuality, he married one of his students, but left her permanently after not even three months, in 1877. After extreme depressions, a suicide attempt and fleeing the country, he was able to give up his hated profession as a professor and devote his life to creativity thanks to a generous allowance paid to him by a rich admirer of his, Madame Nadezhda von Meck. The rich widow of a railway engineer, she made it possible for him to undertake a number of journeys abroad and took over his debts, but suddenly and without reason stopped corresponding with him after 12 years. On 6th November 1893, Tchaikovsky died in St Petersburg. The family stated the reason for his death as poisoning from Cholera although modern scholarship is inclined to credit the story that he committed suicide. Because he had made sexual advances to a young aristocratic member of Russian social circles, he succumbed to the decision resolved by a disciplinary court comprising former law-school classmates, and committed suicide by taking arsenic.